Since 1946, Asheville Community Theatre has been producing dramas, comedies, musicals and more. For years, we were a vagabond company, producing shows in auditoriums all over the city. But in 1972, the curtain opened for our first show in our permanent home (it was Camelot – and we still have cast members from that show who are still heavily involved at ACT!). We are grateful to those board members and community leaders who worked so hard to secure a long-lasting space for ACT, and we are thrilled to embark on a renovation to that space. We’ve divided the project into three phases. 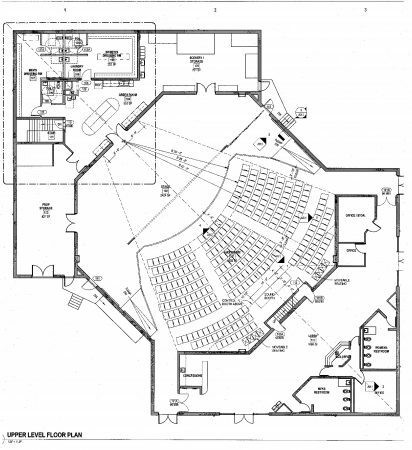 Phase One is the renovation of the Mainstage auditorium, the Green Room and the dressing room spaces. Phase Two is new construction – we’re planning a new black box theatre in our own backyard! Phase Three will renovate the existing Blomberg Annex (currently our costume, prop, and furniture storage) into an Education Complex. Phase One is up first. And it begins this month! We’re putting in new seating, updating lighting and sound equipment, optimizing the acoustics in the room with panels and baffles, hanging a new grid, and completely upgrading the Green Room and the dressing rooms (if you’ve ever been in one of our shows, you know how long we’ve needed this). We’ll be working all through the spring on Phase One, and will reveal the updated interior in August 2017 when we open The Producers. For more information about our Capital Campaign, including how you can get involved as a Lead or Major donor to help us build the future of ACT, contact Executive Director Susan Harper by email or by phone at 828-254-1320 x29.